Due to his age and success Huang became known in Fujian as “Young Hero”, and later played an active role in the war with Japan. The recognition of his fighting abilities quickly earning him the rank of colonel. Following the Communist take-over of mainland China, Master Huang emigrated to Taiwan. There he met and knelt before Cheng Man-Ching an outstanding exponent of Taijiquan. 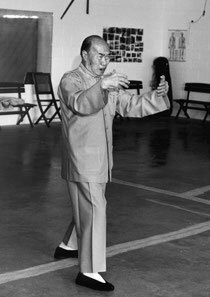 For seven years he devoted himself to being a disciple of Cheng and his Art of Taijiquan, before moving to Singapore in 1958.